HubSpot Marketing is an advanced system that brings all of your marketing efforts together, and helps your team grow traffic and increase conversions. You can use its drag-and-drop functionality to design and modify beautiful websites without asking your IT team for assistance, and make sure all pages are responsive regardless of the device used by your visitors. In a nutshell, you can create attractive and highly personalized landing pages for your campaigns, and distribute both static and dynamic HTML messages that can invoke the response you expect. To ensure that all your data is taken into account, HubSpot Marketing will help you design workflows as you need them, prepare and format content for publishing, and integrate information from other system without any coding experience. Once you’ve designed your website, HubSpot Marketing helps you prepare and optimize attractive content, and distribute it among the right audiences. The system provides a variety of SEO and social suggestions for you to share content with the right influencers and audiences, and drive traffic with little to none coding skills. What is really specific about it is the possibility to create engaging calls-to-action, and to personalize messaging to meet the specific needs of your visitors. At the same time, you can rely on HubSpot Marketing’s contact forms and A/B tests to develop successful lead generation strategies, and decide which visitors have the genuine potential to become qualified leads. The process doesn’t stop here, as you are enabled to give all valuable leads a personalized path to purchase and turn them into paying customers, and afterwards report your strategy’s impact and contribution on sales. The company also has a reputation of excelling in customer support, given that a friendly and knowledgeable agent is always a message/call away from solving your inquiries and answering your questions. One shouldn’t neglect the fact that becoming a HubSpot user also means joining a large, world-wide community of satisfied users, and gaining access to a robust resource library that helps optimize the value of this system. The all-in-one marketing package is only a part of HubSpot’s Growth Stack bundle, as the company intends to facilitate end-to-end the critical operations of sales teams, and thus offers a dedicated CRM (free to use) and a Sales Hub where plans also start at $0 per month. You can acquire information on all three packages on the company’s website, and contact sales for info on joined packages. What makes HubSpot unique in the marketing software arena is foremost its compactness, as this platform packs, so to say, all essential armory for sales teams and marketing agents to place their product/service where it is most likely to attract attention. The all-in-one inbound marketing software helps create, launch, and distribute efficient campaigns, and does so with the virtue of a friendly marketer that doesn’t fade from the scene once a client is brought on board. HubSpot’s marketing automation goes beyond traditional email marketing, as it allows users to design their own workflows, prepare, format, and publish content, and seamlessly integrate contact profiles and information to make the most of their campaigns. Basically, HubSpot Marketing makes it possible to work in a familiar environment, and segment, nurture, and evaluate leads in a more personalized way. The best way to think of HubSpot marketing is as a ready-to-use marketing funnel – You simply create an account, place contacts in the most appropriate stage of the funnel, score them, and personalize and distribute your content. Once done with nurturing and evaluation, this system also gives you access to traffic data (a special lead timeline) and lets you analyze the impact of your marketing strategy on sales and overall performance. The email marketing tool, for instance, is versatile, and lets the user prepare both static and dynamic HTML messages, customize them in accordance with your customers’ persona and behavior factors you believe could give you the response you want. Among other features, you will also have access to scheduling, contact database, mobile marketing, and much more. When it comes to social media, HubSpot Marketing makes it possible to gain valuable social intelligence, and distinguish sources that bring you the most qualified leads (based on interests and lifestyle) instead of managing several profiles. In such way, HubSpot makes it possible to distinguish and focus on leads that are most likely to close a deal. If using the platform’s CRM and Sales solution, you will have all information instantly updated, and be able to govern and maintain your customer relationship from the first until the last moment. 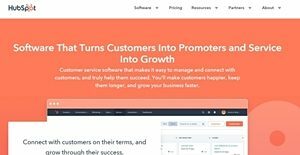 What makes HubSpot Marketing a valuable investment for small businesses and startup teams is foremost its land page builder – a no-brainer, drag-and-drop tool that requires no coding skills to create beautiful websites. You can use the system’s keyword tools and SEO optimization to distribute nothing but the best content, and manage the way how leads interact with it from a single, dynamic dashboard. The focus on personalization makes it possible to remove HubSpot’s branding and use your own instead, so that customers will know who they’re dealing with from the very first moment. The same customization and configuration options apply to the company’s Sales and CRM modules. HubSpot Marketing can be connected to HubSpot CRM or Salesforce to ensure that all customer interactions with your brand are recorded and examined. With all meaningful data packed in one place, you can pull off accurate and confident reports, and learn how each of your campaigns is affecting your sales. What may as well be of interest to you is that HubSpot Marketing is a rare catch when it comes to connectivity. While working in absolute synergy with other HubSpot products, Marketing is also well integrated with other valuable marketing assets, including the leading CMSs (content management systems), email service providers and communication tools, productive eCommerce platforms and marketplaces, and of course – the essential social networks. For unobstructed productivity, HubSpot Marketing guarantees full access on mobile devices, and allows users to stay in control of their campaigns even when not in the office. HubSpot Marketing has also been praised for delivering reliable and in-time support, as it provides access to an experienced and knowledgeable team of marketing professionals. You can reach them via live chat, email, or phone (depending on the plan you’ve chosen); or look up solutions independently using the platform’s vast resource & study library. With the compactness of its marketing suite; and the unique number of unique bells and whistles that close important marketing gaps, one can easily say that HubSpot Marketing is a reasonably priced system. The basic contact database with traffic and conversion analytics can be acquired absolutely for free, while paid plans vary between $50 for the Starter Package and $2,400 for enterprises interested to manage more than 10,000 contacts. If interested, you can also check out the Growth Stack bundle (CRM+Marketing+Sales) and choose HubSpot as a unified solution for your sales department. Enterprises have different needs and requirements and no software solution can be perfect in such a condition. It is pointless to try to find an ideal off-the-shelf software app that fulfills all your business needs. The smart thing to do would be to customize the solution for your specific wants, employee skill levels, finances, and other elements. For these reasons, do not hasten and invest in well-publicized leading applications. Though these may be widely used, they may not be the best fit for your specific wants. Do your homework, check out each short-listed platform in detail, read a few HubSpot Marketing reviews, contact the maker for explanations, and finally choose the application that presents what you want. How Much Does HubSpot Marketing Cost? We realize that when you make a decision to buy Marketing Software it’s important not only to see how experts evaluate it in their reviews, but also to find out if the real people and companies that buy it are actually satisfied with the product. That’s why we’ve created our behavior-based Customer Satisfaction Algorithm™ that gathers customer reviews, comments and HubSpot Marketing reviews across a wide range of social media sites. The data is then presented in an easy to digest form showing how many people had positive and negative experience with HubSpot Marketing. With that information at hand you should be equipped to make an informed buying decision that you won’t regret. Killer software that will kill your competitors! What are HubSpot Marketing pricing details? What integrations are available for HubSpot Marketing? If you need more information about HubSpot Marketing or you simply have a question let us know what you need and we’ll forward your request directly to the vendor.